One under-appreciated side-effect of the Fed's quantitative easing and zero-bound interest rate policies is the sizable "inflation tax" borne by all those who have been holding cash, cash equivalents, and short-term securities since the end of 2008. By my estimates, this tax could total $1 trillion or more. As the public becomes increasingly aware of this under-the-radar tax, the demand for cash and short-term securities (cash equivalents) is likely to decline, and that will complicate the Fed's QE exit strategy. The Fed's target for the fed funds rate (the rate banks charge each other to borrow bank reserves) sets the tone for all short-term interest rates. 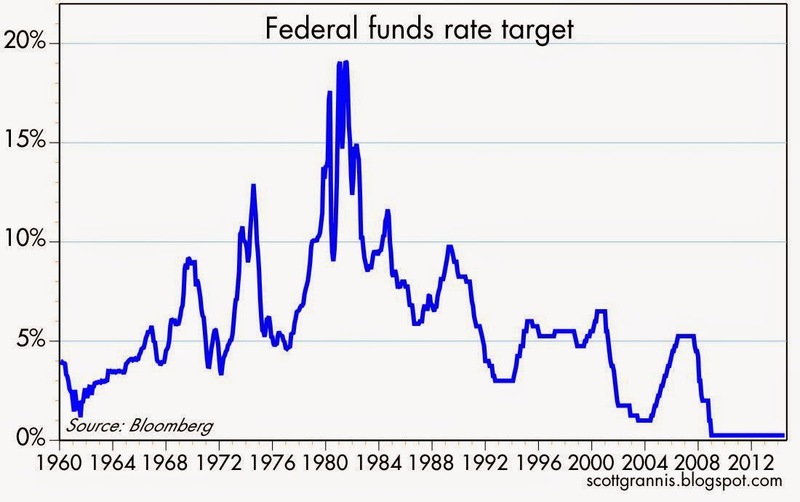 Since late 2008, the nominal target for the the overnight Fed funds rate has been 0.25%, and the Fed has been paying 0.25% on bank reserve balances held at the Fed. 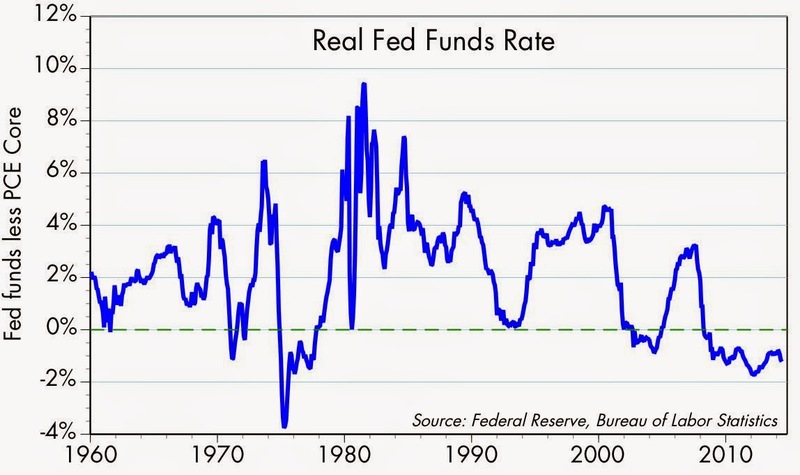 As the graph above shows, this extremely low level of short-term rates is unprecedented in modern times. For their part, banks, which have invested essentially all of their savings deposit inflows since 2008 in bank reserves, have paid very low rates to the holders of savings deposits: 1-mo. Libor has averaged 0.24% since the end of 2008 and is currently a mere 0.16%, and most banks and money market funds now pay between 0 and 0.15% on short-term savings deposits. Obviously, banks need to pay less on their deposits than they earn on their assets (e.g., bank reserves). Taking fees into account, the effective nominal interest rate on most savings deposits today is zero or even slightly negative. 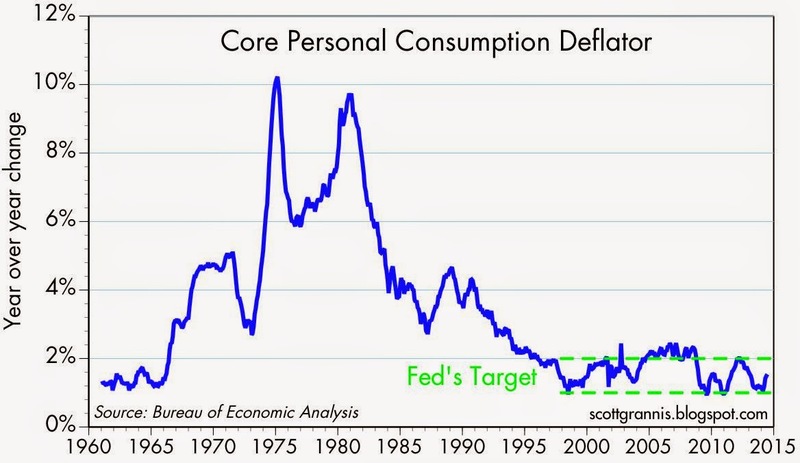 The extremely depressed level of nominal interest rates since late 2008 has been exacerbated by the fact that inflation has averaged about 1.5% per year, according to the Core Personal Consumption Deflator, the Fed's preferred inflation measure (see graph above). The combination of very low short-term interest rates and 1.5% inflation has resulted in 5 ½ years of negative real short-term interest rates. As the graph above shows, this is the longest and most significant period of negative real interest rates in over 50 years. Recall that the negative real interest rates of the late 1970s occurred during a time of sharply rising inflation. Negative inflation-adjusted short-term interest rates affect a lot of people and a lot of money. Anyone holding cash and cash equivalents (e.g., currency, checking accounts, savings deposits, money market funds—the things that comprise the M2 measure of the money supply, arguably the best measure of the public's store of readily-spendable cash) during this period has suffered a significant loss of his or her purchasing power—on the order of 7% or so. Bank savings deposits now represent about 65% of M2, while checking accounts ($1.6 trillion) and currency ($1.2 trillion), represent another 25%. By the end of this year, when interest rates are almost certainly going to remain very close to zero, the cumulative loss of purchasing power suffered by those holding cash and cash equivalents (as proxied by the M2 measure of money and using the real Federal funds rate as a proxy for the real yield on M2) will be, by my estimates, at least $700 billion. Using M2 as a proxy for cash and cash equivalents gives a lowball estimate of the inflation tax, however, since it does not include the purchasing power lost by those who held short-term notes yielding less than 1.5% (i.e., less than the annualized inflation rate) since late 2008. That would include any Treasury securities with less than 5 years' maturity, since the yield on 5-yr Treasuries has averaged 1.5% over this period. (For example, 2-yr Treasury note yields have averaged 0.5%, so those who held 2-yr Treasuries have suffered a -1% annual real rate of return. For holders of T-bills it's even worse, since the average nominal yield on 3-mo. T-bills since late 2008 has been a mere 0.08%.) It also doesn't include the inflation tax effectively paid by holders of institutional money market funds, commercial paper, and bank CDs not included in M2. So the total inflation tax on cash and short-term financial instruments is probably well in excess of $1 trillion. The "inflation tax" I'm referring to is the loss of purchasing power that results from holding a monetary instrument with a yield less than the inflation rate. The holder suffers a loss of purchasing power, while the issuer—in most cases the U.S. government and the Federal Reserve, for whom money, bank reserves T-bills, and short-term notes are a liability—benefits because their liabilities can be repaid with cheaper dollars. In other words, the purchasing power you lose every day as a result of holding cash, cash equivalents or short-term securities is equal to the amount the federal government and the Fed benefit. The inflation tax is a direct, and largely underappreciated transfer of wealth from the private to the public sector. And it's big. 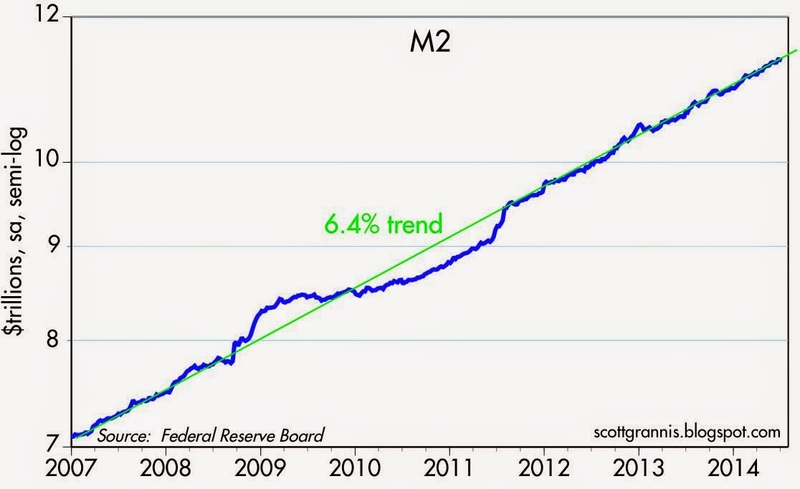 The M2 measure of money supply has been growing at about a 6.4% annualized rate for over 7 years. This growth is very much in line with the past history of M2, which has grown at an annualized growth rate of 6.4% over the past 15 years and 6.1% over the past 20 years. The lion's share of M2 growth in recent years has come from bank savings deposits, shown in the graph above. This isn't money that the Fed has "pumped" or "dumped" into the economy, it's money that people want to hold for reasons of prudence and safety. Nobody holds onto currency they don't want, and nobody is being forced or encouraged to hold bank savings deposits, since they yield almost nothing. For the past 5 ½ years, the public has had a very strong demand for cash, cash equivalents, and short-term securities, even though they "cost" over $1 trillion to hold. The public has been willing to pay this inflation tax because the public has been very risk averse. However, as I've noted before, risk aversion is on the decline. As time passes, the public will be less and less likely to want to hold safe assets that carry with them a significant inflation tax. Banks too will be less willing to hold the current $2.6 trillion of excess reserves that currently pay only 0.25%; they will be more likely to use them to increase lending, which could potentially yield a lot more. All of this will make more urgent the need for the Fed to reverse its QE efforts by draining reserves and increasing the interest it pays on reserves, lest a surfeit of bank reserves lead to an excess of money supply vis a vis money demand—the classic prescription for rising inflation. As money demand declines, the public will want to reduce its holdings of money and safe assets in favor of assets with a positive real yield. A reduction in money demand will thus put inexorable pressure on short-term yields to rise and riskier asset prices to rise. Some might call this a "melt-up," and it wouldn't be far-fetched. The six year long enduring bull stock market ended July 25, 2014. The prior financial system peak came in 2007, with the failure of what was thought to be “money good” sub prime debt. The world’s economy was regenerated in 2008 as investors came to trust in the US Federal Reserve monetary policy of QE 1, where Distressed Investments, like those traded in Fidelity Investments FAGIX Mutual Fund, were traded out with the banks for US Treasuries, TLT. A bear stock market has commenced as a fall lower from the stock market peak has started, as is seen in the Proshares 200% Inverse Market ETFs, such as SSG, and the Direxion 300% Inverse Market ETFs, such as SOXS, trading higher in value. Most definitely look for the value of M2 Money to decline, evidencing the failure of credit, that is the failure of trust in the Banker Regime’s fiat money system. Inasmuch as the failure of credit commenced the week ending July 25, 2014, investments will literally be going up in smoke, as the Interest Rate on the US Interest Rate, ^TNX, continues higher from 2.47%, destroying the basis of Credit Investments, as well as diminishing the basis and effective yield on Yield Bearing Investments; FIW, SEA, IDOG, GRID, IST, and XLU, have already lost principal. This is why I hate the FRB and pray for their demise. On the other hand, you have the big spenders and debtors whom are so glad to be subsidized by others. 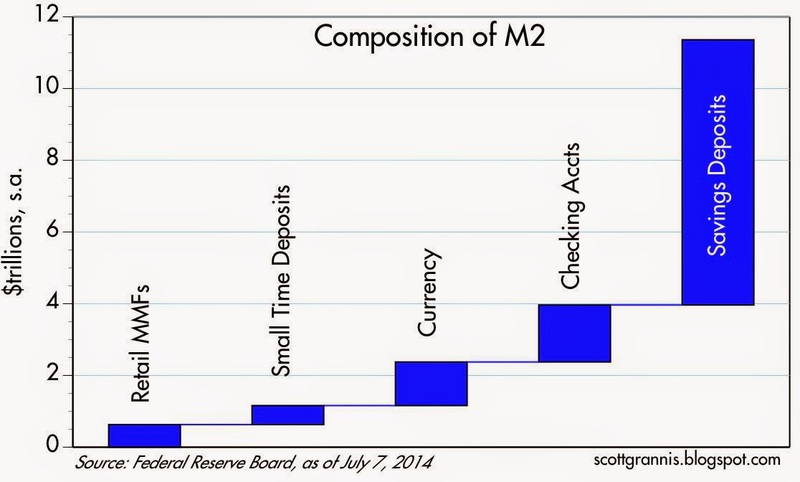 Scott: Isn't the M2 chart, the one showing an unrelenting rise at the same rate as the past few years, evidence that the demand for money is NOT receding? I'm as shocked as the next guy that the public seems perfectly willing to absorb the purchasing power tax which, as you note, is substantial. But there it is. M2 is not declining, or even rising at a reduced rate. The link you provided, the one that purportedly shows a risk aversion reduction, shows that the POTENTIAL for a decline is risk aversion is certainly in the cards. But aside from a very recent increase in bank lending, I'm not seeing a decline in risk aversion just yet. It would seem the M2 supports that. No? Fascinating post, worth re-reading many times. But we might not see higher interest rates ahead---see Europe and Japan. Okay, I ask Scott Grannis this: infflation and interest rates have been in global secular swwon since the early 1980s. A 30-year trend towards not galloping inflation, but turtle inflation and even minor deflation in Japan. What caused this massive and persistent, international disinflation? Why would this trend change now? To be sure, risk aversion is only beginning to decline. The first evidence was the drop in gold prices in recent years, followed by the rise in real yields on 5-yr TIPS. C&I Loan growth has picked up quite a bit this year, and that is also good evidence of a decline in risk aversion. 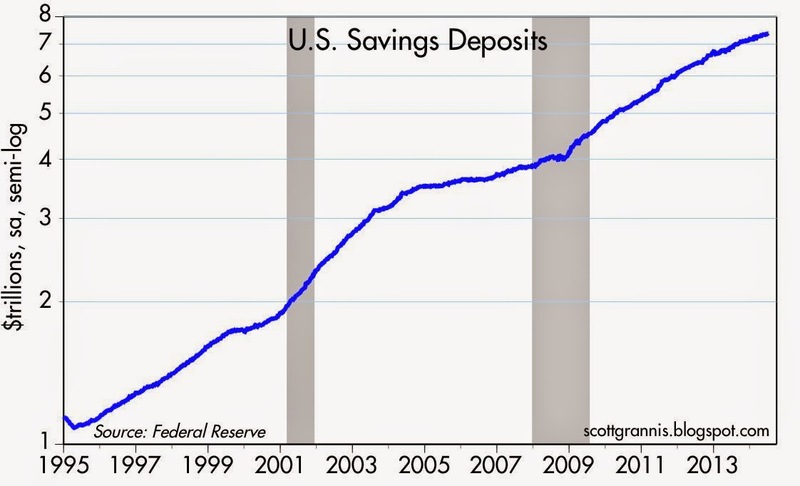 The growth of bank savings deposits has declined in recent years, though it still remains decidedly positive. PE ratios are now above average, and credit spreads are nearing their lows; I take both as evidence of declining risk aversion. Thanks, Scott. Good points, all. The great disinflation started in the early 1980s, and it was the result of central banks in all major countries severely tightening monetary policy in response to the great inflation of the 1970s. Most central banks remained tight until the early 2000s, with the great exception being the BoJ, which tightened too much. The Fed began to ease in the early- to mid-2000s, and that fueled the housing boom. All central banks are now in the process of relaxing monetary policy in a fairly aggressive fashion. It's a sea change in monetary policy that could usher in another era of rising inflation. But Japan has had little success in raising inflation, and Europe is going the other way, to deflation. As Milton Friedman said, it is hard to tighten your way to higher interest rates for long, Interest rates tend to go down---tight money means lower rates in the long run. But the Fed now is tightening up---so maybe interest rates will go down. Inflation too. Also making for low inflation has been globalized labor and product markets. Interest rates are held down by globalized capital markets and huge savings pools everywhere. We might see US Treasury rates lower a year or two from now. Central banks, which became independent public agencies in the 1980-1990s (ECB, BoJ and effectively the Fed, under Volcker) act like independent public agencies. That is to say, they developed exalted mission statements, and ossify. These are public agencies, remember? The central banks of the developed world have been cast and then hardened into glorified inflation-fighting stances. Remember when Volcker "beat" inflation? He declared history at 4-5 percent. Today the Fed has a "target," but read "ceiling" of 2 percent---and that during the Great Recession. Some FOMC members rhapsodize about deflation. Janet Yellen has said that a 1 percent inflation target is feasible. It will take a change in central bank cultures for them to balance to new needs. But as independent public agencies, change is very slow, as in glacial or nil. The BoJ only changed due to direct pressure. To---hold on to your hats---seek a two percent inflation rate, but really that means one percent. The ECB and Fed are somewhat insulated. That can be good...or it can be bad. Larry Summers gave an insightful interview somewhat related to this discussion. The takeaway to me is that what we think of as historical normal levels of investment and willingness to hold cash, may be different because of the skewed wealth concentration, and the lower levels of capital required for investment today. Here I think there are a number of answers both on the savings side and on the investment side. On the savings side, there’s a tendency towards increased saving because of greater wealth inequality and a rising share of profits increased the share of income going to those with high savings propensities; because increased uncertainty and greater indebtedness encouraged savings to repair balance sheets; because an expectation of lower returns leads to people or pension funds needing to put aside more money to prepare for their retirement or to send their kids to college or whatever their savings target is. All of that tends to lead to an excess of savings.